It's that time of year! State exams are beginning all over the country, and every teacher everywhere is experiencing some level of anxiety over student performance. Unfortunately, we are not just anxious about student success, but we are also anxious about how their performance on those exams will reflect on us. 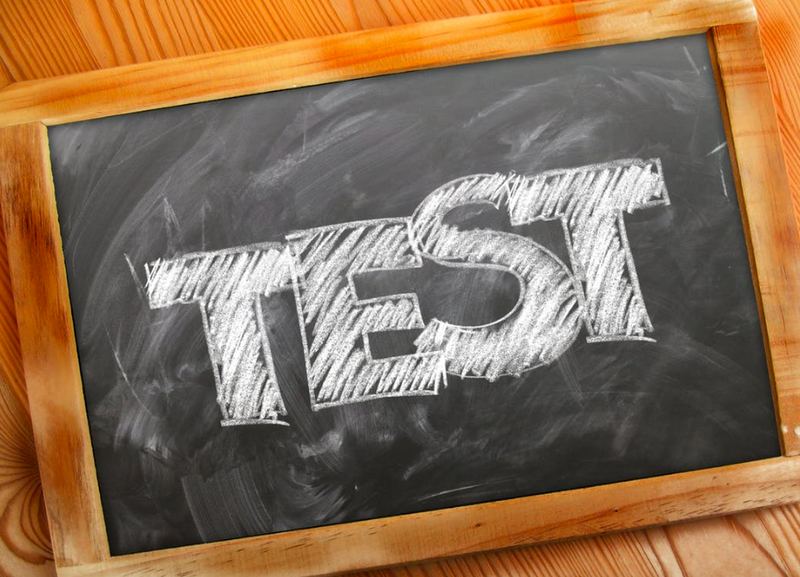 For those of you not in the know, or who are fortunate enough to work in a state that does not subscribe to this practice, many states tie student performance on state-mandated exams to the evaluation of their teachers. For me in Florida, how my students perform on their Florida Standards Assessment (FSA) counts for 30% of my yearly evaluation! This can be quite frustrating for teachers who teach ESL or SPED students who struggle with literacy, test-taking, and language. The day that test scores become available to teachers is a mix of fear and excitement - how did my students perform? I have experienced opening that document and feeling my heart sink into my stomach. When students perform poorly on their exams, it reflects poorly on me. But I taught them all of the things! Unfortunately, test scores are looked at as a means of determining how well a teacher taught the standards and concepts prescribed by the state, so when students do poorly, it stands to reason that the teacher did poorly teaching. The only way to recover from poor test scores is reflection. What didn't work this year? What can I improve on for next year? What can I do to better address my students' needs? But what do you do if you have done that and are working your teacher tail off and still aren't getting results? Well, I have been there too. The students who I teach struggle so hard in testing. This is for a myriad of reasons that I could probably write a dissertation on, but I will spare you! It wasn't making a difference. Then, at some point it dawned on me. Students don't understand the questions. And not in the obvious way. Duh, right? Of course they don't understand the questions, they are getting them wrong! No. What I mean is... they don't understand the question. They don't understand what it is asking them to actually do and what they need to call upon in their brain in order to answer it. Students might be able to identify a theme in their sleep, but if they don't understand that a question is asking them to use that skill, it doesn't mean anything. Seems obvious, right? But understand what a question is asking and understanding what a question is asking you for are different! I pulled texts from our reading program Achieve 3000 and focused on the questions themselves. Not answering the question, but dissecting it into it's parts. 1. What is this question asking me to DO? 2. What skill do I need to know in order to answer this question? 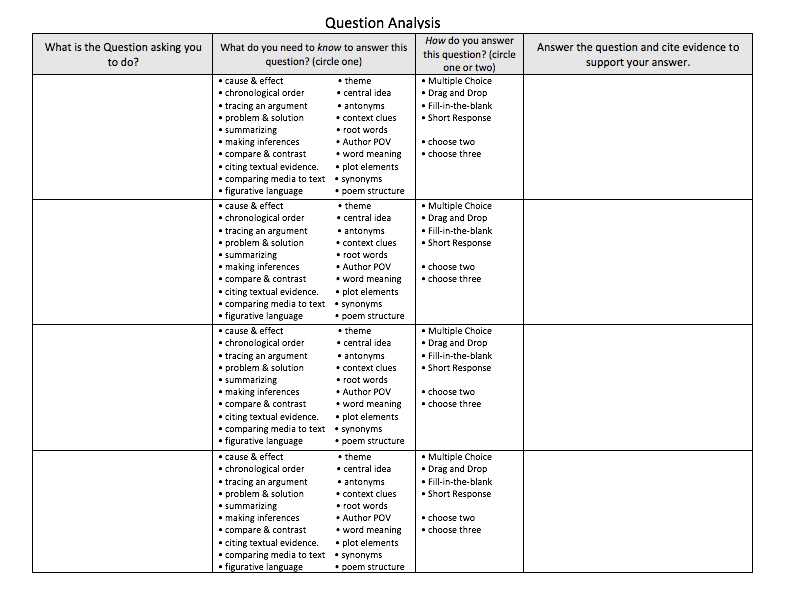 I created a 4-column chart that includes check boxes related to the skills that they obtained throughout the school year, and had students practice dissecting the questions. At first this was a disaster and students had no idea what they were supposed to do. Their first instinct is to provide an answer to the question and move on! What sorcery is this question dissection? Once we did a few together and students began to practice, they began to see the correlation between the language used in the question and the skills that we had practiced in class. They realized that they knew more than they though they did. Rarely on an exam is a question going to directly ask a student to recall a specific skill. Instead they will be asked indirectly to apply a specific skill to a particular text within the context of that text. So what students need to learn is how to correlate the question itself to a skill that they know. By having them deconstruct questions, they are practicing how to understand the question. Of course, students need to apply that type of deconstruction when they take the actual exam and really analyze each question, but if they are comfortable with doing this or they recognize certain patterns in how questions are asked, it can make taking the text much less painful for them. Nothing is worse than knowing that you students can identify the central idea of any text, only to find that they got every central idea question on the exam wrong! 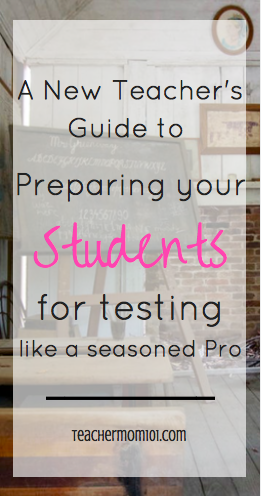 If your students are struggling with state exams, try having them deconstruct questions. In the future, I will use this strategy from the beginning of the year so that students have ample time to practice! Hi could you send me a copy of this document that I can add and change? I am teaching 5th grade and would love to use this. Do you have sample questions? Same! I'm a 5th grade self contained teacher and I could GREATLY benefit from having this document to use across content! May I PLEASE have an editable copy of this???? Can u send me a copy of the chart? Hi, this is great! Especially for my ESL students! could you please send me a copy of your chart please? my email is elizabeth.darnell@cowetaschools.net. Can you also send me a copy?Thanks!! Can you please send me a copy too? Thanks!! I love this, as well. It's so frustrating that the state tests seem to intentionally try to confuse the kids, by the test language and format. I think this would be incredibly helpful. I would appreciate your help by having a copy too. I, too, had the same epiphany last year! If a question asks a student the following: How does the sentence in the box below help contribute to the development of ideas in paragraphs 4-7? WOW!!! To answer that question students have to know so many different things. 1.) What does contribute mean? 2.) Identify the sentence in the box and “understand” how that sentence “contributes” to the development of ideas in paragraphs 4-7. 3.) What does “Development of Ideas” mean? 4.) Go BACK and READ paragraphs 4-7 and decide the correct answer. (This is an actual question we went over in a 6th ELA Class today.). You are so right!!! We teach central idea, theme, elements of plot, find the evidence, and on and on.... and then, often on the test the question being asked is like a foreign language to the students. I’m glad I saw your blog today. It affirms my own “AHA” moment from last year. .... and just for the sake of knowing.... I wonder why the test makers create questions that must be analyzed, synthesized, and evaluated BEFORE attempting to answer it? I get that students need to be able to infer what is being asked, but in some cases, like the question I used above, the actual question may have lost the the intended purpose, which was to find out if the student could choose how a sentence helped to make a section of text better. For the past two years, I have been deconstructing questions, and teaching my students to do so; however, I wonder. Is it necessary to have students analyze and deconstruct at least 60-65% of the questions? It’s definitely “good for thought.” Thanks for sharing!! Do you have something like this for math?? I would love a copy of the document too. Fabulous idea! THANK YOU! !